If you are seeking a venue for the perfect romantic break or desire an escape to a dreamy countryside location within easy reach of the magnificent north Cornish coastline and beaches, the opportunity awaits you at Trevenning Chapel. A top-pick for honeymooners, anniversaries, Valentine's breaks and for those seeking the chance to feel cosseted, this well appointed barn conversion is situated in the hamlet of Trevenning close to the picture postcard village of St Tudy with its popular pub the Tudy Inn, two miles from the head of the Camel Trail and less than four miles from the coast. Little light pollution means that this is a great place to look at the stars and planets on a clear night. Possessing immense rustic charm, thick granite stone walls contain a spacious open plan interior beneath dramatic tall vaulted beamed ceilings lit with chandeliers. Sharing the grounds of Trevenning Farm with the owner's residence and Trevenning Barn (property reference 1517) it is none-the-less private and well screened from view. The stable door entrance is approached through a private courtyard garden, blossoming with a mass of English cottage-style plants and flowers. Once inside the eye is drawn to the large gothic-style picture window and far reaching views over neighbouring lawns towards a serene rural backdrop. A king size bed takes stage on a mezzanine floor next to a modern shower room and separate WC. There is a sitting area with leather settee on the ground floor and then a step down to a kitchen/dining area. A mix of modern and classic style furnishing blend tastefully and guarantee a comfortable stay and to the rear is a second private suntrap courtyard equipped with sun-loungers and garden furniture for alfresco meals. Romantic strolls can commence from the door step through scenic countryside footpaths or on the moorlands nearby at Bodmin. 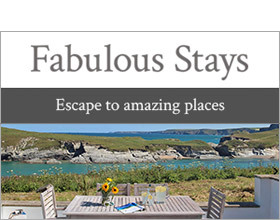 Close to the Atlantic Highway (A39), the cheerful seaside towns and villages at Port Isaac (8m), Padstow (14.3m) and Boscastle (11.5m) and the long tracts of sandy beaches at Polzeath (12.9m) and Trebarwith Strand (7.5m) are within easy reach. There is ample parking and a pub in St Tudy. All ground floor with mezzanine floor. 1 x king size double and en-suite shower room with basin and separate WC on mezzanine floor. Open plan living room with kitchen, dining are and sitting area. Note: No children over 2.